I recently read, and subsequently reviewed (see post link below), The Nordstrom Way to Customer Service Excellence. In that book, the authors cited FirstMerit Bank as an example of a financial institution that implements Nordstrom-like tenets throughout their company. 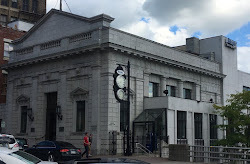 One concept mentioned was a competition for Best Branch. This got me thinking of how community banks could create an objective incentive system for branch personnel to culminate in the awarding of “Best Branch”. So many banks create branch incentive systems that are opaque, i.e. not understood by the persons that are supposed to be motivated by them. If this describes your incentive system, I suspect it doesn’t properly motivate your branch personnel. When I was a branch manager many moons ago, my incentive system was totally transparent and I knew my quarterly bonus to the penny. Problem was that it was a sales system, which brings me to another challenge, incentives that position your bank as a product pusher. This incentive manifests itself in offering the product du jour to every customer your branch personnel comes into contact with, much like when my 20 year-old daughter’s bank called her for a home equity loan. The final common challenge of branch incentive compensation is that it is not meaningful. It equates to nothing more than a holiday bonus. If any of these three branch incentive systems describes yours, I offer you the following to consider. The JFB branch incentive system consists of three components: Profit performance, customer service, and branch improvement. Each component is equally weighted to determine branch ranking in a hypothetical bank’s 20-branch system. The bonus is distributed as follows: Top quartile (ranked 1 through 5) receives a $40,000 bonus (for the entire branch); 2nd quartile receives a $25,000 bonus; and 3rd quartile receives a $15,000 bonus. The lower quartile receives either no bonus or the traditional small holiday bonus. An individual branch in hypothetical bank has approximately $250,000 in annual salary and wage expense. Therefore, top quartile performers’ bonus would equate to 16% of employees’ salaries... not an insignificant amount. Profit Performance: The accompanying table illustrates how the system works. For spread measurement, hypothetical bank uses coterminous market rates to credit deposits, and to charge loans. Your bank can have some other method to determine spreads. So long as it is used consistently and you can explain it, it will provide the same incentive. There are three components to the profit performance piece: deposit spread plus fee income, loan spread less provision, and pre-tax profit. Using profitability as the driver for incentive compensation motivates branch personnel to focus on those customers and prospective customers that are most valuable to your bank… customers that don’t squeeze you for every nickel of rate or want all fees waived. Imagine the change in branch personnel behavior. Will they plead for a rate promotion to grow deposits? Will they contact their supervisor to give a CD-only customer a special rate? Or will they develop a calling plan to build deeper relationships with those customers that deliver superior spreads to your bank? Customer Service: Many banks already utilize external mystery shopping firms to objectively gauge the quality and consistency of customer service. The JFB Best Branch Incentive System makes those scores meaningful to the pocketbook of those being measured. 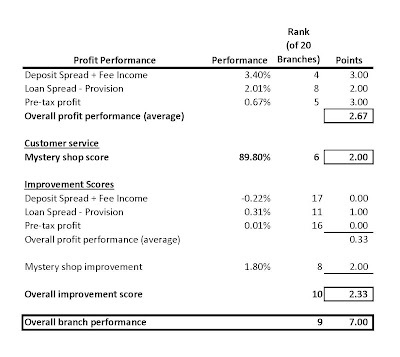 Branch Improvement: The final measurement tool is how much the branch has improved in profit performance and customer service. It is recognition that moving a poor performing branch from point A to point B will receive its just rewards. The JFB Best Branch Incentive System can have objective add-ons, such as awarding a branch a 0.50 kicker if they ranked 1st in any of the three categories. You decide what will best motivate your branch employees to execute on your bank’s strategy, continuously improve, and increase profits. Making incentive compensation transparent and more meaningful will identify top performers, elevate their level of compensation, and make the branch a career destination instead of a waypoint to the next best thing. After all, keeping high performing branch bankers in critical customer contact positions is key to your success, isn’t it? Is the bank sales culture gone wild? Have we checked out of business banking?